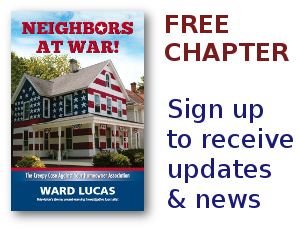 HOA Embezzler Archives - Neighbors at War! Because it’s Christmastime, we usually expect a little more embezzling by employees of Homeowners Associations. Michelle Haughton, the accounts receivable employee for the Bear Valley Springs HOA apparently took the word ‘receivable’ a little more literally than her job description intended. The cops won’t say how much money was missing, but it’s greater than $2000. She’s now charged with embezzlement and grand theft. It won’t matter much to homeowners. They’ll just see a special assessment come along and no one on the board will tell them them what it’s for. So strange to think that a whole movement would begin around the subject of backyard chickens. In our American frontier, no one would give a second thought to a hen or two laying eggs for the family. But things have changed. Chickens are about as welcome in most neighborhoods as ticks on a picnic blanket. Still, there really is a movement to convince city councils everywhere that chickens in the backyard can actually be a good thing. In fact, another small town in Colorado has just approved it. There’s a new high rise luxury condo on Mission Street in downtown San Francisco. Built in 2009 with every classy aesthetic feature, it was high-priced and all the units on its 22 floors sold out quickly. It’s called The SOMA Grand. It’s governed by an HOA, of course. Residents of the new building say almost immediately after they bought in, they started having problems with flooding during rainstorms, cracks in walls, and failures of sealant joints. The HOA has scrambled to get into court to sue everyone connected with the construction. “Going for the deep pocket”, as lawyers say.